Joseph John Gerken was born on Monday, March 9th, 1857, in Fetterman, Taylor County, (West) Virginia. His father, Frederick A. Gerken, was a German immigrant who followed his work on the Baltimore & Ohio Rail Road to Grafton, arriving in 1852. His mother, Rebecca Merrill, was from the mountains of western Maryland. She would die of tuberculosis when Joseph was two months old. Joseph was the youngest of four sons by his father’s first marriage. His father remarried when Joseph was 5 years old, and he was raised with two of his older brothers, a step-brother, two half-brothers, and two half-sisters in Fetterman and Grafton, West Virginia. Joseph left home about the time of his father’s death in 1879. He began work for the B & O, returning home to marry Ida Aeolia Seargeant, whose family had come to Grafton during the Civil War from Louisa County, Virginia. They would start their family in Wheeling, West Virginia, before returning to Grafton about 1890. Together they would have five sons and two daughters. After returning to Grafton, Joseph worked as a foreman and salesman in the lumber industry, employed at the O.G. Augin mill and the Mountain State Lumber Company. However, in the 1920 census, he was listed as a bookkeeper for the railroad office. Baptized at St. Augustine Catholic Church in Grafton, Joseph was raised in a catholic family. However, as an adult, he joined the Methodist church, and his funeral service was conducted by the pastor of the West Main Street Methodist Episcopal Church before his burial at Bluemont Cemetery in Grafton. 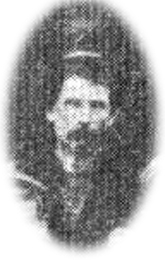 The above newspaper image is the only known photograph of Joseph John Gerken.